Signed: Case, dial, and movement signed. Accessories: Accompanied by period correct IWC presentation box. Some of the most important dive watches of the 20th century were introduced in the mid 1950s following World War II, incorporating technological advances developed during the war. A late entrant to this market was IWC. While they followed nearly a decade after others, the Aquatimer remains a distinguished model for both its aesthetics and engineering excellence. 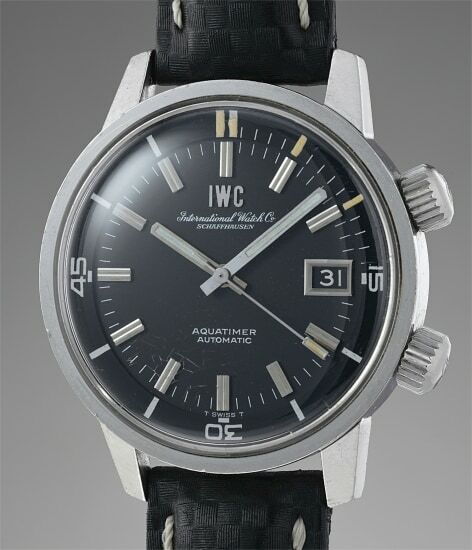 Released in 1967 and produced in far fewer examples than competing dive watches, the reference 812 AD is an iconic IWC watch for connoisseurs. The Aquatimer has a modern, sleek appeal with a ‘super compressor’ case that has less bulk compared with other dive watches of the era. A timing ring placed underneath the crystal replaces the outer rotating bezel. This works as a safety mechanism, keeping the bezel from being bumped and accidentally changing the time, as well as giving the watch a flatter profile. Further, the in-house caliber 8541 movement features the innovative “Pellaton” winding system, patented by IWC in 1950. This horological innovation uses a bi-directional rotor improved efficiency, giving greater winding power. Case, dial, and movement signed.